HOLISHIP’s WP7 (Integration of Methods and Tools, Software Platforms) focuses on the integration of software tools, spanning the entire range from mission profiles, general arrangement, hydrodynamics, structures, engines and machinery to life-cycle cost assessment. The integration will be based on CAESES® by FRIENDSHIP SYSTEMS. During the course of the project CAESES® will be extended to form the basis of the HOLISHIP Platform for ship design. 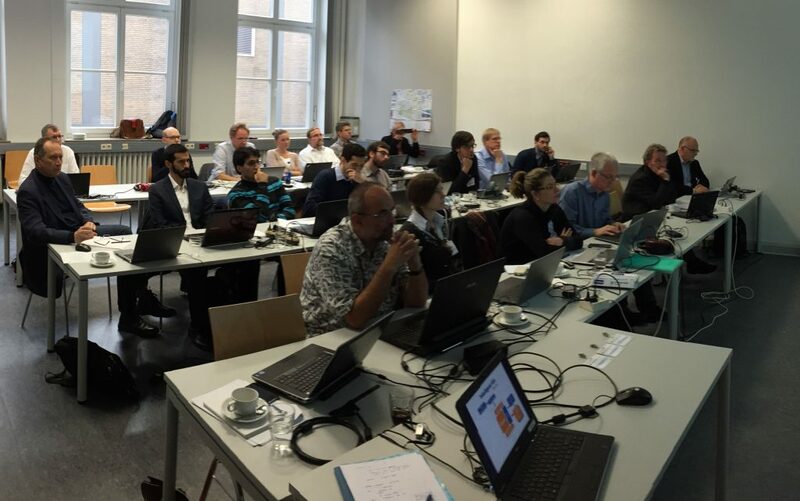 The partners of WP7 – a team of 19 companies, institutes and universities from all over Europe – along with several further partners from the HOLISHIP consortium met in Bremen from Monday, November 21, to Wednesday, November 23, 2016, for a hands-on integration workshop to discuss and test the integration of their tools in CAESES®. The flexible integration platform enables tools running in batch-mode to be coupled and automatically executed, also across operating systems. Typically, a set of input and output files is utilized as templates to set up interaction with CAESES®. The work done in WP7 aims at rapid prototyping of tool integration for concept and contract design as well as re-design for improved vessel operation (e.g. retrofitting to accommodate changes in the operational profile). At the meeting two of HOLISHIP’s application cases, the design of a RoPAX and a double-ended ferry were identified as starting points for first implementations. Hochschule Bremen, Germany, hosted the meeting in a very nice working environment, the academic setting adding to the good spirit and atmosphere. The latter was certainly facilitated by a nice social event at one of Bremen’s local breweries on Tuesday evening. Partners that attended the meeting came from Hochschule Bremen as hosts (task leader WP7.2), FRIENDSHIP SYSTEMS as organizers (leader WP7), HSVA (consortium leader), NTUA (task leader WP7.3), DNV GL (task leader WP7.4), BALance, Bureau Veritas, Center of Maritime Technology, CETENA (also representing FINCANTIERI), ELOMATIC (along with CADMATIC), Institute of Shipping Economics and Logistics, Lloyds Register, MARINTEK, Rolls-Royce Marine, University of Liege, University of Strathclyde and Uljanik.